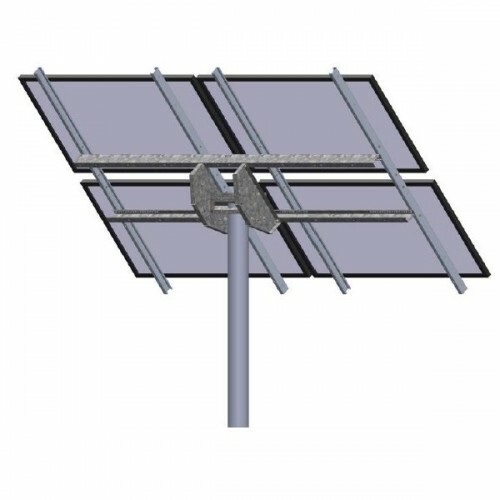 Tamarack recently introduced their Universal Large Module Mount which is a heavy duty pole mount system ideal for larger 60 and 72 cell modules with dimensions less than 79.5" x 39.5". All mounts are manufactured using pre-galvanized steel and heavy-duty corrosion resistance 5000 series aluminum. Using a single 6", SCH 40 steel pipe (not included) you can easily mount the number of modules specified in the part description without complex sizing calculators. The LTP-LCR/090 Top of Pole Mount is designed for mounting (4) 60 or 72-Cell module in a landscape orientation. If you need to mount 1, 2 or 3 modules, you should consider the STP mounts instead. Designed for 100 mph wind loads standard. If you expect 100+ mph winds you will need to add their VEE BRACE Kit (sold separately). All hardware needed for assembly and module mounting is included, no extra U-bolts or ala carte items required.